This section allows you to setup the tax tables, GL accounts, and W2 information for standard deductions such as Federal, State, FICA and Medicare. You can also create optional deductions such as insurance, advances and garnishments. Each type of deduction has slightly different setup steps; if you still have questions about setting up deductions after reading the following sections, please call the Cyrious Technical Support Department. To setup the store options in Payroll, select Options in the Payroll Setup screen. Enable Vacation - check this option if you want to enable vacation and will accrue vacation pay. Select the default expense account and the default accrual account for this option by clicking the ellipsis to the right of the drop down box. Enable Sick Pay - check this option if you want to enable sick pay and will accrue sick pay. Select the default expense account and the default accrual account for this option by clicking the ellipsis to the right of the drop down box. Enable Holiday - check this option if you want to enable holiday pay and will accrue holiday pay. Select the default expense account for this option by clicking the ellipsis to the right of the drop down box. Default Hours worked per year - The number you put here will be the default for all employees; however, you can override this number on individual employees' setup screens. 2,080 hours is the default number of hours for an employee who works 40 hours a week and 52 weeks a year. 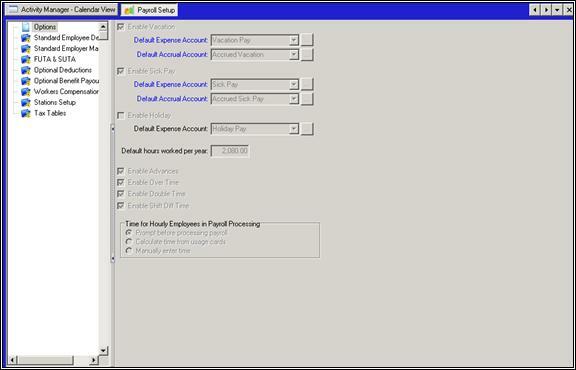 Enable Advances - check this option if you want to enable payroll advances for employees. If this option is left unchecked, it will not appear on the Employee Setup screen. Enable Over Time - check this option to allow a field on the employee setup screen where you can enter an overtime rate for hourly employees. Enable Double Time - check this option to allow a field on the employee setup screen where you can enter a double time rate for hourly employees. Enable Shift Diff Time - check this option to allow a field on the employee setup screen where you can enter a shift differential rate for hourly employees. Calculate time from usage cards - if this option is selected, time from usage cards will automatically be used for hourly employees when processing a payroll cycle. Manually enter time - if this option is selected, you will need to manually enter time for hourly employees when processing a payroll cycle. To setup the standard employee deductions, select Standard Employee Deductions in the Payroll Setup screen. Enter the name of the tax table to be used for this deduction. The Federal Tax table will be included with the Payroll Module. The GL account number to post the accrual to will show here. This GL account is selected when you set up the tax tables (more on Tax Tables in Chapter 5). Enter the box to fill in on the W2 form. Enter the name of the default state tax table to be used for this deduction, if applicable. The GL account number to post the accrual to will show here. Enter the box to fill in on the W2 (optional). Enter the name of the default local tax table to be used for this deduction, if applicable. Enter the box to fill in on the W2 form (optional). Enter the percentage of wages to be deducted. Enter the maximum taxable wages as listed in the IRS Publication 15 (Circular E) for the current year. Enter the GL account number to post the accrual to. If you wish the system to automatically calculate and create a voucher for your tax payment, check the “Automatically Create Bill when Posting Payroll” box and enter the Vendor name. Enter the GL account number to post the employer expense to. Click Add to add a new deduction. Enter the name of the Deduction. Enter your Federal Unemployment tax percentage. If this is an active expense, check the box before Active. Enter your Federal Maximum Taxable wages. Enter the name of the Deduction. If you deal with multiple states, be sure to use descriptive names. Enter the State's unemployment tax percentage. Enter the State's Maximum Taxable wages. This section allows you to create optional deductions such as 401K's, medical insurance, garnishments and others. When setting up your optional deductions, you will also need to specify if each deduction is a pre-tax deduction. For example, medical insurance premiums and 401K deductions are usually pre-tax deductions, but some plans are different, so you will need to ensure that the optional deductions are set up correctly. Click New on the toolbar to the right of the screen to add a new deduction. Enter the name of the deduction. If this is currently an active deduction, check the “Active” box. Select the deduction type. If this is to be deducted from the employee without an employer match, select “Employee - Deduct from pay” in the Who Pays? section. If the employer is matching the deduction, select the “Employer - Do not deduct from pay” option. Enter the maximum amount of the deduction if applicable. Enter the GL accrual or expense account number to post to. If you wish the system to automatically calculate and create a voucher for this deduction, check the “Auto Create Bill when Posting Payroll” box and enter the vendor name. Enter the box (and code, if applicable) to fill in on the W2 form. If this is a pre tax deduction, check the “Pre Tax Deduction” box and select all the applicable taxes to deduct before the calculation. Select the deduction type. If this is to be deducted from the employee without an employer match, select “Employee - Deduct from pay” in the “Who Pays?” section. If the employer is matching the deduction, select the “Employer - Do not deduct from pay” option. Some companies may offer additional insurance to their employees. If your company offers additional insurance coverage that is separate from medical insurance, you should set this up as a separate deduction. Simply follow the same steps as described above for medical insurance. Occasionally, an employee will have a wage garnishment, such as for unpaid child support. Follow the same steps as above to set up this deduction. Once the deduction is set up here, you will need to go to the employee setup screen to select this deduction, enter the amount of the deduction and select which paychecks it will be deducted from for any employees who may have wage garnishments. To set up a deduction for uniforms, follow the steps as described for previous deductions. Since uniform deductions are normally taken out of an employees net pay, be sure not to check the Pre-Tax Deduction box for this type of deduction. Some companies will offer other payouts, or benefits, to their employees. These are also known as fringe benefits. This type of benefit may be treated differently as far as taxability, so be sure you have read IRS Publication 15-B, Employer's Tax Guide to Fringe Benefits to be sure these are set up correctly. Click New on the toolbar to the right to add a new benefit or payout. Enter the name of the payout or benefit. If this is currently an active benefit, check the “Active” box. Enter the maximum payout if applicable. Enter the GL account number for the payout to post to. Check the “Exclude from Income Tax Calculations” if this will not be included as taxable income. Note: this will be excluded from the tax calculation and will not appear on the quarterly report; however, it will appear on the W2. Check the “Exclude from Income Tax Calculations” if this will not be included as taxable income. Note: this will be excluded from the tax calculation and will not appear on the quarterly report; however it will appear on the W2. There are lots of different payouts and fringe benefits that companies may offer; we have given a couple of examples above so you can see how to set them up. Cyrious advises all of our customers to consult a tax professional with any questions you may have about benefits offered by your company and the taxability of those benefits. Click New on the toolbar to the right to add a new workers compensation code. Enter the Name of the Workers Compensation Code. If this is currently an active code, check the “Active” box. Enter the default Workers Compensation Code. Enter the Workers Comp Rate for this particular job type. By clicking on “Show Stations”, all stations for the current Workers Comp Code will show. By clicking on “Show Employees”, all employees that fall under the current code will show. There has been a section added to the Station Setup where you can attribute stations to a Workers Compensation Code, and also to a Default Expense GL Account. Click New Department to add a new top-level station, or click New Sub Level Station to add a new lower lever station. Orders and Service Tickets in WIP, Built, and Sale statuses. Line Items; you can also mark the line item as complete when it is set to the selected station. Time Clock - You can allow employees to clock-in for this Station. You can also assign a Workers Comp Code to the station, and a Default Expense GL Account to record time not associated with a labor part. Finally, there is an option to allow employees to be paid while clocked in on this Station. Highlight the Station you wish to edit. Click Edit on the toolbar to the right of the screen-level. Make the desired changes to the Station. Click Save when you are finished to save your changes.